Northland Resources was confronted by troubles on multiple fronts in late January and February as its operating subsidiaries struggled to get its new Kaunisvaara iron ore mine in northern Sweden into a stable operating mode. Northland was short of working capital to fund both short-term and longer-term operations. As a result, on February 8 and 12, the operating subsidiaries filed for reconstruction in a Swedish court, a process that is to some extent comparable to Chapter 11 in U.S. bankruptcy law in that it provides a company with protection from its creditors as it seeks to get on its financial feet. To support the reconstruction, Northland was seeking support from bondholders and stakeholders for about $12 million needed to enable it to continue full operation until March 4, by which time the company hoped to have reached a solution to its longer-term funding needs. Longer term, the company was seeking about $425 million to carry it through to full production. On February 18, the Toronto Stock Exchange notified Northland that it had failed to meet requirements for continued listing on the exchange and that its common shares would be delisted at the close of the market on March 18, with trading of its shares suspended until that time. Northland’s shares are also listed on the Oslo Børs, where trading was continuing, at least for the time being. Northland completed construction of the first phase of the Kaunisvaara project and started production ramp up in November 2012. Its first iron ore concentrate was shipped by rail to the port of Narvik in Norway on December 18, 2012. The company has been targeting shipment of 1.5 million mt of high-quality iron ore concentrate during 2013 and has a goal of reaching its design operating rate of 4 million mt/y by the third quarter of 2014. Northland previously announced that it had entered into off-take contracts with three companies for the entire production from the Kaunisvaara project over the next seven to ten years. Northland got into its current financial bind in part because it decided to fast-track construction by foregoing basic engineering before starting work on the project. Cost estimates were not fully verified and proved to be too optimistic. 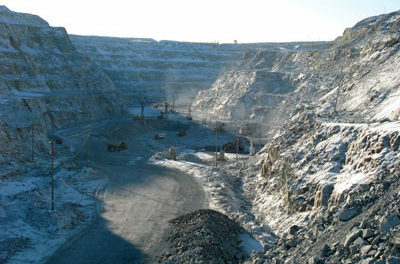 As of the end of December 2012, the company had invested more than $900 million in the project.